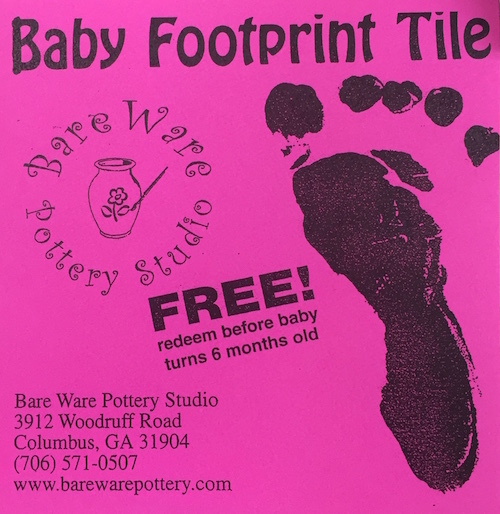 -Receive a free baby footprint tile until the child is 6 months old. -Get a Bare Ware sticker from our location and place it on your car window. Provide proof and we will give you 15% off your order! Bare Ware will give your organization 25% of the fundraiser! Schools, daycares, and church groups always get a discount! Available at any time, even after hours! Live far away and visiting from out of town? Bare Ware Pottery will happily ship a piece back to you. Call us for details! All you have to do is pick up the supplies from our location and have your party, then simply return the pieces to Bare Ware Pottery for glazing and firing. Lead a busy life? Looking to make something special but just don't have the time in your schedule? Ask us about our commissions! !